Update: July 15, 2013 After using this soap recipe for over 8 months, I decided that I needed an extra boost for cumulative dirt. I have changed the amount of Washing powder and Borax from 1/2 c. each to 1 C. each. I have washed three loads with the new mix and find that it is overall less clumpy and the clothes were brighter and softer. There may be a bit of yellowing as with bleach in some fabrics but I'm not sure if it was that or the sunscreen. 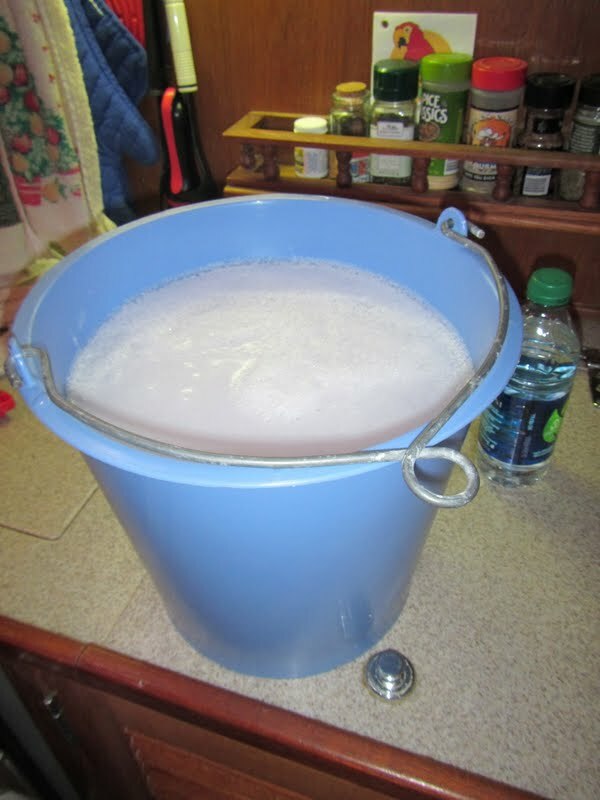 This simple laundry soap recipe will leave your clothes clean and fresh and only comes to about 3 cents per load! Grate the soap and put it in a sauce pan. (the smaller your pieces the quicker it dissolves) Add 6 cups water and heat it until the soap melts. Add the washing soda (NOT baking soda) and the borax. Stir until it is dissolved. Remove from heat. Pour 4 cups hot water into a 2-gallon bucket. Add soap mixture, tea tree (or any other essential oil of your choice) and stir. Add 1 gallon plus 6 cups (22 cups) of water and stir. Let the soap sit for 12 to 24 hours until it gels. A white foam layer will form at the top. You can stir it back in. Use a ½ cup detergent per load of laundry. I use more for more heavily soiled loads. I saved two gallon sized Tide containers for this and filled them to the top plus a third smaller sized bottle. Make sure you have bottles ready. I used a funnel to pour the detergent into the bottles. The scent of the Zote seemed to clash with the tea tree oil at first but after a while, they mixed and smell nice. I've used my soap and this softener since I made them on 10/30 and my clothes are clean and smell very nice. I didn't have to make another batch until mid December. I used to have to add Baking Soda to my towel loads to keep the nasty smell away. I don't do that anymore and my towels smell very nice! IT WORKS!